Watery rice gruel/ rice soup/ Arisi kanji is a instant energy booster which is loaded with proteins, vitamins and starch. It can be given as the very first food to babies before introducing this rice porridge and dal ka pani. It provides instant energy to babies to keep them active for all day. 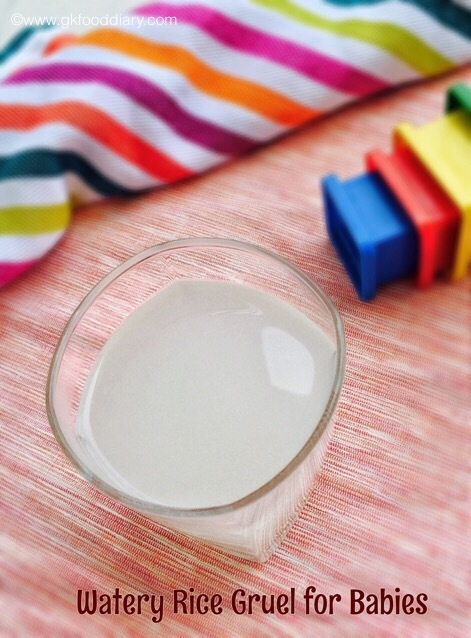 This watery rice gruel also given as a remedy for diarrhea or fever in babies. It helps the sick child to recover quickly. Even it works for adults too. 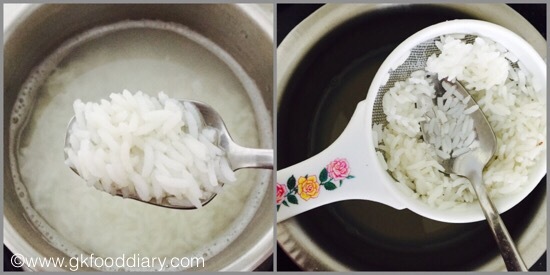 Here is how to make the watery rice gruel recipe for babies. Take 2 tbsp of rice and wash it well. Add the washed rice to a cooking pot or sauce pan and add 2.5 cups of water. Cook the rice in medium flame with occasional stirring. Cook the rice until it gets completely cooked and soft. It may take 10 to 15 minutes. Once the rice is completely cooked, switch off the flame. Let it cool down for some time. Then Mash the rice a bit with a laddle n stain through a strainer to get a thin watery rice soup. 1. Take 2 tbsp of rice and wash it well. 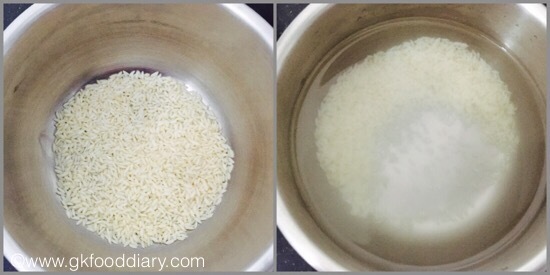 Add the washed rice to a cooking pot or sauce pan and add 2.5 cups of water. Cook the rice in medium flame with occasional stirring. 2. Cook the rice until it gets completely cooked and soft. It may take 10 to 15 minutes. Once the rice is completely cooked, switch off the flame. Let it cool down for some time. Then Mash the rice a bit with a laddle n stain through a strainer to get a thin watery rice soup. Healthy watery rice gruel is ready to feed your baby. 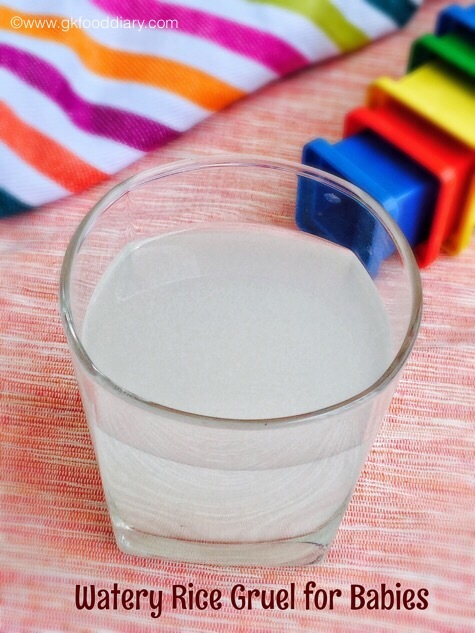 Initially offer your baby rice water alone, then you can gradually include the mashed rice as well. You could add dal ka pani or mashed dal and vegetable stock to this rice soup for extra nutrition and flavor. Generally rice doesn’t cause any allergies, but check for symptoms and stop feeding your baby if you find any. Salt or sugar is not advisable for babies under one year. 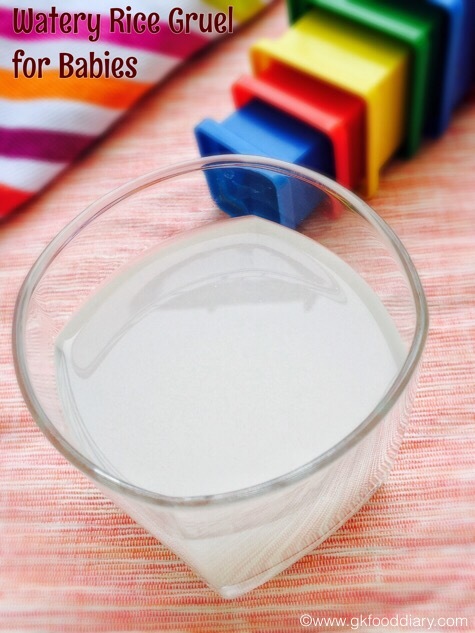 If you are feeding this watery rice gruel for toddlers, you could add salt. You can even pressure cook the rice for 3 whistles and then stain the water to get a watery rice gruel. 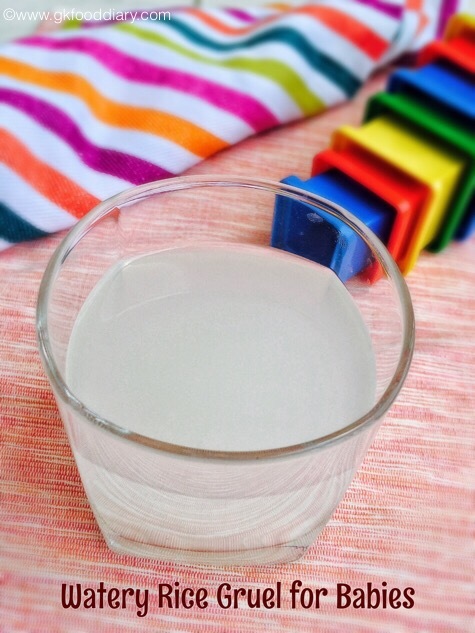 Is it ok for adult to drink this daily as a substitute of plain water? Will it do any harm to the body? Tq. How much mililitre per day is okay for 7 mths baby? Maybe some 50 ml. Make sure to give breastmilk or formula milk as a major feed. Any soup or juice should be given occasionally or when baby is sick.. It might be a growth spurt. If he is active and normal, don’t worry. Give some time for him to back to routine. In the meantime give some liquid based foods like soups, porridges, juices to keep him hydrated. If it’s still a problem and if he’s dehydrated, visit a doctor immediately. My daughter is 10 months old she have very cold. Is it ok to give her rice water and how much should I give her in a day, and what else can I give her to eat at this time.